I looked up at the stage, admiring the simplistic yet colorful sets. A Palace resided on one side, while a cave was on the other. The Sky was green with a tint of blue and seemed magical. The lights dimmed, and the music began to play. The stage began to fill with people, dressed in clothes of Arabian nature. For you see, we were about to enter Aladdin’s universe. However, one would not take long to realize the actors in this production were different. A kind of difference that is often frowned upon or misunderstood. The majority of this cast was disabled. Disabled either by deafness, blindness, mental intellect and many others. This was the Detour Theatre Company, which aims to give the experience of theatre to those who may not otherwise get the chance. I watched with the most curiosity and fascination as the musical went forward and the actors were animated, excited, and happy. Occasionally, an actor might forget a line. But, the director, Sam, prompted them with usually just one word, and they would continue on as if nothing had fazed them. Aladdin himself had difficulty speaking, but he did his best and was in character the entire time. Aladdin came to an end and HONK began. The Ugly Duckling who was misunderstood. But soon became a swan of absolute beauty and embraced his uniqueness. The Duckling’s Mother was blind, but was a true actress and had a singing voice that is record- worthy. The Frog danced with the most energy and heart. 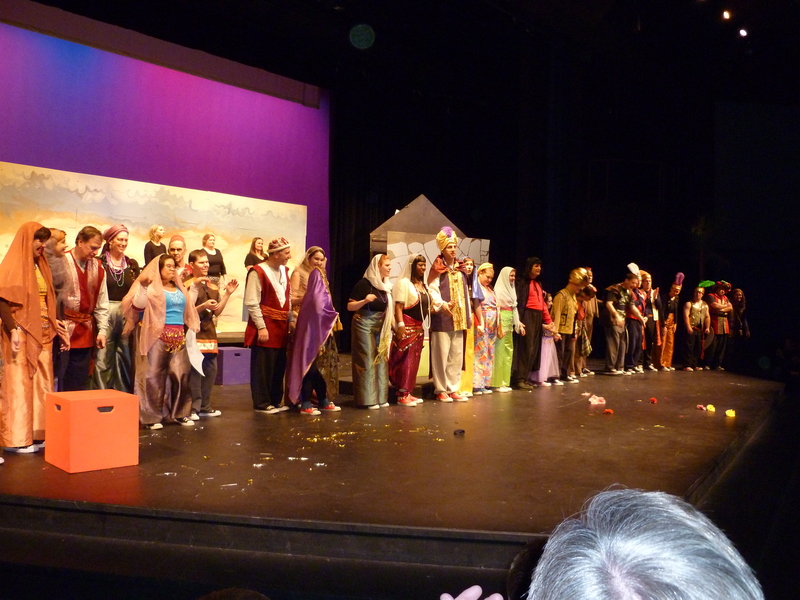 The entire company finished the production asking us all to join them in ‘A Whole New World,” with smiles and waves. And, then, I began to think. I began to realize. For a good while, it was daunting to answer and complicated. But, I actually sat down and thought about it. I’ve always listened to instrumental music more so than ‘normal’ songs. This started because I grew up hearing the classical radio station a lot as a child. And so, in listening to instrumental music, it provides the backdrop to ‘movies’ in my mind’s eye. It’s much like when you read a novel, you ‘see’ the action playing out in your mind. This works the same way, except with music, I’m free to create whatever I want to see. Instead of words, I’m hearing the film score to whatever I chose to picture. Once I have an idea, and I’m actually writing, I’ll put on music that fits the mood of the scene I’m writing. I’ve read that this method is used by a few other writers, but I did it even before I thought it was a technique. I’m going to be writing a version of ‘Hansel and Gretel’, and I’m listening to John Williams’ score to ‘Harry Potter’ for inspiration. And that, is my writing process. That’s where I was for a good part of my day. The store that has every ice cream scoop you could imagine as well as very expensive sofas. And, don’t forget the aprons, purses, and the Every Recipe A Man Should Know book. I wasn’t here by choice, mind you. My mother wanted me to go with her, so I obliged. I swear, my mother should have been a designer. She’s always remarking about colors, types of floors, how the walls could be extended… really. She needs to get a degree in this now. But, as we were finally on the second floor (after an hour) she ran to a sofa she liked. She’s been wanting to buy a new one for months. And, then, I see it happen. A man, with a name tag, smiles at her. Yes. A Salesman is on his way over to try to get my mother to spend money on this couch. My mother had been admiring a painting above the couch, on the wall. “Isn’t that print beautiful?”, says the Salesman. His voice is higher than most, and it is awfully piercing. “Yes, I love the colors,” says my mother. I quickly pretend to be looking over a dining room table, hoping the Salesman doesn’t ask me what I think about it. “So, this couch is on sale,” he says, as he rubs the leather with his hand. The Salesman had a quick look of surprise flash across his face, but he recovered. ” Let me go print off some information for you.” He said, running off as if he’d lose the sale. He came back, with colors, designs, and his business card. Now, the man attempted to engage my mother in conversation. So much, that she began to grow annoyed. But, she kept it pretty well hidden, nodding her head and saying, “Oh?” a lot. Finally, he got the hint and told us if we had any more questions to give him a call and off he went. And so, that was my day, at Crate and Barrel.